For a star athlete in a major American city, having a night off during the regular season’s grind often means choosing from an excess of options to decompress and shed loose the cumbersome burdens of a tense 82-game season. Table service at a chic club? A live music performance? Surely there has to be a party to attend somewhere, right? If you’re Anze Kopitar, how about tuning into the Ontario Reign’s webcast to watch your younger brother? 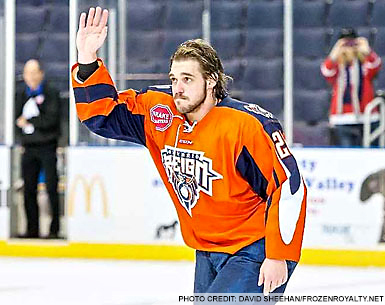 Gasper Kopitar, five years Anze’s junior, is now in his second week with the Inland Empire-based club. After a challenging span of several months in which he left his central Sweden team looking for new opportunities, the former L.A. Junior King has joined Los Angeles’ ECHL affiliate refreshed and with a new lease on playing hockey. His CAA agent, Judd Moldaver, raised the possibility of returning to Southern California continue his career, an option that took some growing in to. Recalling that his older brother enjoyed playing for Mark Hardy – an assistant coach with Ontario – he backtracked eight time zones to build off the momentum of a promising debut to his professional career. Though he was eligible to return to the USHL’s Des Moines Buccaneers as an overager a season ago, he potted eight goals as part of a 14-point 20-year-old season with Mora IK in Sweden’s HockeyAllsvenskan as he spent time playing alongside his older brother during the NHL lockout. Despite scoring 36 goals over his final two seasons of junior hockey, the scoring touch never materialized at the start of the 2013-14 season. After 13 games with Mora, followed by two months of waiting for the right opportunity, one materialized in the ECHL, where the Reign have followed up back-to-back Pacific Division titles with a 24-5-1-3 start to the 2013-14 season. Perhaps the smaller ice surface fits with the skill set of the two-way forward with a quick release who can “muck it out,” according to Ontario head coach Jason Christie. In four games, Gasper has a goal, three points, 14 shots on goal and a plus-5 rating while skating alongside Whittier native Matt White and Ontario veteran Kyle Kraemer. Gasper Kopitar is not the property of the Los Angeles Kings, though he’s familiar with Toyota Sports Center and his brother’s teammates. As the son of Matjaz Kopitar, the coach of the Slovenian Olympic team that will participate at the upcoming Olympics, an interesting dynamic exists that has helped to produce positive intangibles in the way Gasper plays the game. Though Anze noted that “it’s hard to say” how growing up under Slovenia’s most prominent hockey coach affected his overall attributes, he did recognize some advantages. He played for his father during Olympic qualifying last February, when Slovenia ran the table against Belarus, Ukraine and host Denmark to claim an Olympic bid. The Slovenes will be heavy underdogs against the United States, Slovakia and host Russia in Group A of the Preliminary Round when the men’s Olympic tournament begins on February 13. Though Gasper represented his country during the Division I World Junior Championships, Olympic qualifying and the World Championships, he was not among the player named to the 25-man squad that will compete in Sochi next month. And while there have been recent quotes made in North America by players critical of the decisions that will keep them at home in February, Gasper took the high road. Instead, he’ll watch the tournament from Southern California and while on road trips with the Reign – provided that the time difference doesn’t affect his game preparation. He still has good friends on Team Slovenia, all of whom will have his unconditional and unadulterated support and backing. As for his new teammates, he’s working his way into a locker room that has generated a great deal of regular season success but is looking to advance past the second round of the Kelly Cup playoffs for the first time in franchise history. That effort will be aided if the team can continue to rely upon another clutch performance or two by the player who wore number 22 in Sweden but sports “26” on the back of his Ontario jersey. On Sunday, January 5, Reign pressure disrupted an overtime three-on-two rush by the visiting San Francisco Bulls, turning the broken play into an opportunity of their own. Kopitar and White generated a two-on-one in the other direction, which culminated in a pinpoint White pass that fooled the San Francisco goaltender and provided Kopitar ample amount of space to work with. A moment later, Ontario was celebrating a 3-2 win over San Francisco courtesy of a Gasper Kopitar overtime game-winner, and his older brother had the pleasure of watching the game live and with his family, not on the pay-per-view webcast.